Multiscale Biomimetics & Manufacturing Lab focuses on the study of mechanics of macro/micro/nanoscale components in nature using fundamental principles of Mechanical Engineering and applies them to the development of bio-inspired functional structures, devices, and systems with innovative multiscale manufacturing techniques. We focus on the study of mechanics of macro/micro/nanoscale components in nature using fundamental principles of Mechanical Engineering and apply them to the development of bio-inspired functional structures, devices, and systems with innovative multiscale manufacturing techniques. 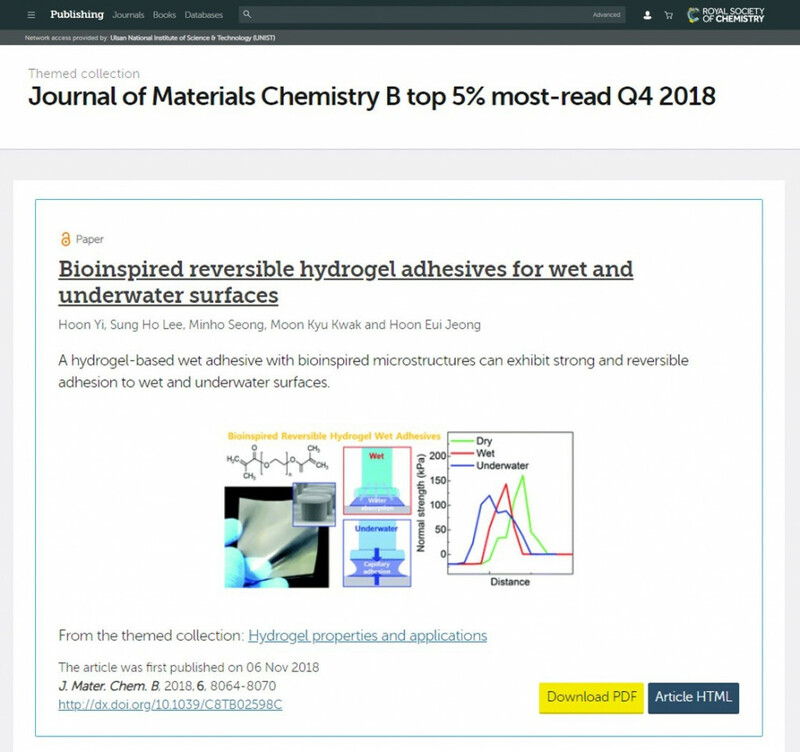 Our article titled ‘Bioinspired Reversible Hydrogel Adhesive for Wet and Underwater Surfaces’ (https://doi.org/10.1039/C8TB02598C) was in the top 5% of most read articles published in the ‘Journal of Materials Chemistry B’ during October-December 2018. This article has been included in most-read Q4 2018 virtual collection. 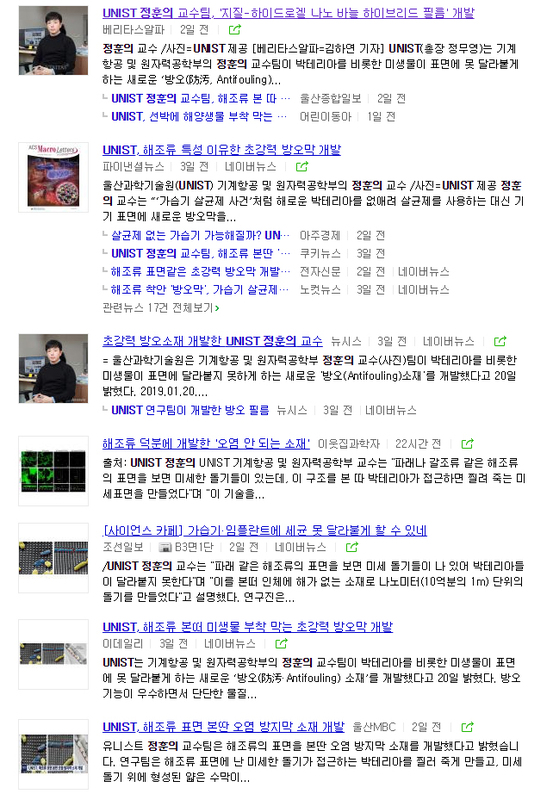 Our work has been introduced to a number of press. Our work on robust biofilm-resistant materials (Lipid-Hydrogel-Nanostructure Hybrids as Robust Biofilm-Resistant Polymeric Materials, ACS Macro Lett., 8, 64-69, 2019 https://doi.org/10.1021/acsmacrolett.8b00888) has been introduced to a number of press. 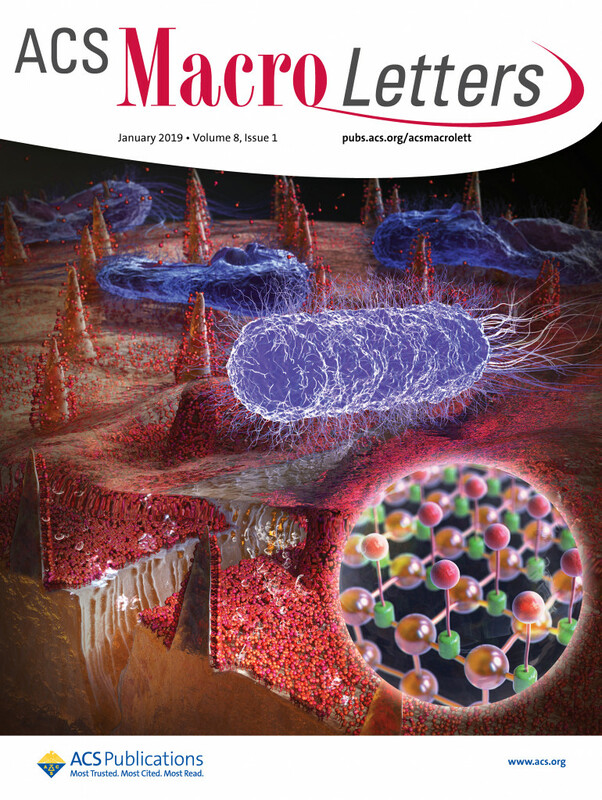 Hyun-Ha and Kahyun’s paper entitled “Lipid-Hydrogel-Nanostructure Hybrids as Robust Biofilm-Resistant Polymeric Materials” has been published in ACS Macro Letters https://doi.org/10.1021/acsmacrolett.8b00888 as the supplementary cover paper https://pubs.acs.org/toc/amlccd/8/1#Mastheads (ACS Macro Lett., 8, 64-69, 2019). Many congratulations! 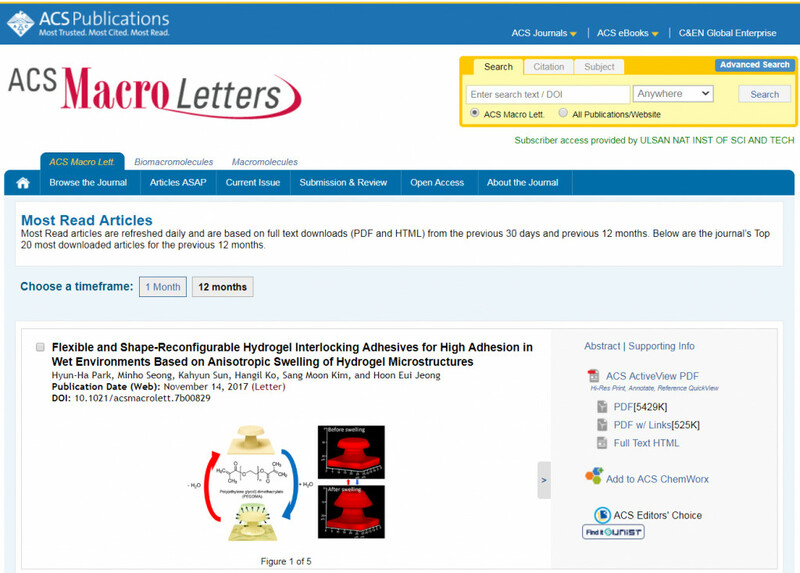 Our paper published in ACS Macro Letters (“Flexible and Shape-Reconfigurable Hydrogel Interlocking Adhesives for High Adhesion in Wet Environments Based on Anisotropic Swelling of Hydrogel Microstructures” https://doi.org/10.1021/acsmacrolett.7b00829) has been selected as one of the journal’s Top 20 most downloaded articles for the previous 12 months. 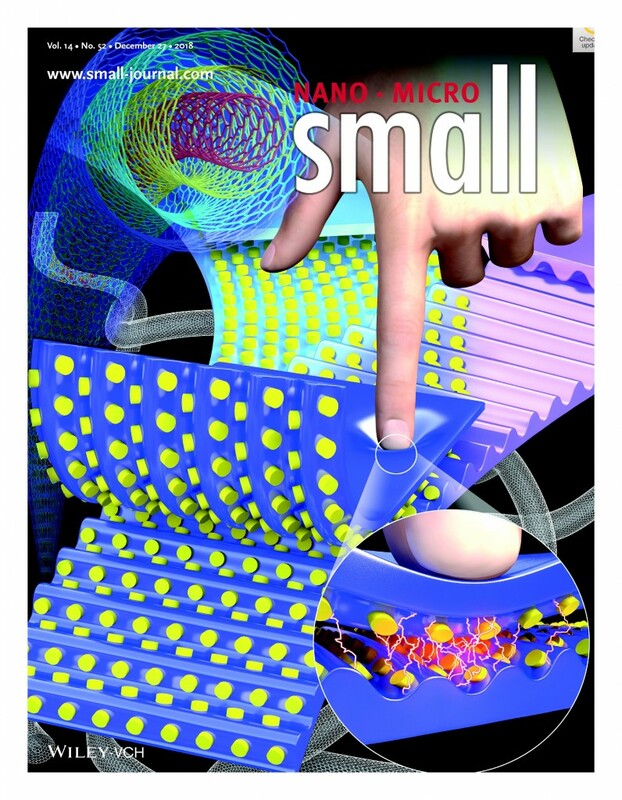 Kahyun and Hangil’s paper entitled “Hybrid Architectures of Heterogeneous Carbon Nanotube Composite Microstructures Enable Multiaxial Strain Perception with High Sensitivity and Ultrabroad Sensing Range https://doi.org/10.1002/smll.201803411” has been published in Small as the inside front cover paper https://doi.org/10.1002/smll.201870253 (Small, 14, 1803411, 2018). Many congratulations! Dinner party for the end of year in 2018!